Weather emergencies and natural disasters can strike at any time. You may be homebound for several days. Even worse, you could be evacuated from your home. In either case, you need to make sure that your family disaster kit includes items for your pets, as well as for the human members of your family. 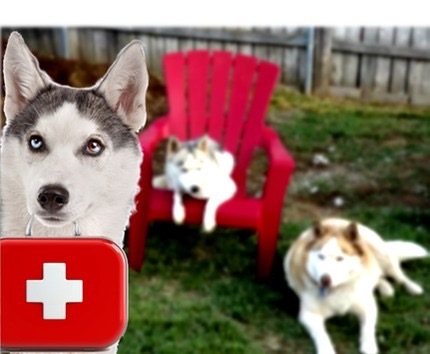 Make sure your huskies are microchipped and wearing collars with ID tags on. If you and your pet get separated, this will make it easy for a rescue shelter or vet to contact you. Make sure the company that you got the microchip from has your updated name, address and contact information. (Remember to update them when you move or change phone numbers). Make sure the ID tags contain your name and latest contact information. Keep at least 7 days of food and water on hand for your pets. If they need medication, make sure to have 7 days worth of that too. Remember to rotate your dry food and medication every three months. Keep an extra leash, collar, and chew toys on hand as well. Poop bags and a harness are good ideas too. (It is much easier to hold onto your husky if they are wearing a harness). Cotton balls for cleaning small wounds. The time to find out where you are going to stay if you are evacuated is BEFORE disaster strikes. Contact your local police or emergency management agency and find out where your local evacuation center is in your area. Ask if they take pets and, if they do, what restrictions they place on them. Depending on what they say, you may not be able to bring your pets with you to the shelter. If this happens, you will need to make other arrangements. Check to see which local motels and hotels take pets and, if they do, what restrictions they have as well. Sometimes your local vet, kennel or animal shelter will take in animals during emergency situations. Know where these facilities are located and how to reach them. Keep in mind that their space is very limited. It is advisable to have a backup plan in case these places are full. Depending on when the emergency strikes, you might not be at home. Ask a trusted neighbor if they would be willing to look in on your husky, or even take them into their home if need be. Remind them that HUSKIES are ESCAPE ARTISTS so they should be extra diligent. Give that person a key to your home. Make sure they know where you keep the food, water and medication for your pet, as well as when they eat and how much food and medication to give them. Keep your pets on leash or in crates even after you return to your home so you can make sure there are no holes or other damage that would allow them to escape and get loose. Finally, remember that, just like humans, pets are susceptible to stress after a disaster. (this information is not intended to be used as an alternative to medical advice. we are not vets.